Some Ochsner Health System patients are leaving their early pregnancy obstetrician appointments not only with clean bills of health but also with internet-connected devices and a plan for fewer in-person visits. The women, as participants in Ochsner's Connected Maternity Online Monitoring program, called Connected MOM, are part of an effort by the New Orleans-based system's executives to change how their providers treat routine pregnancy, seeing their patients in person less frequently while simultaneously keeping a closer eye on them through remotely monitoring key metrics. “We have to invent a new way of managing large numbers of patients effectively,” said Dr. Richard Milani, Ochsner's chief clinical transformation officer. The remote patient-monitoring systems market is expected to hit $46 billion in 2020, according to Global Industry Analysts. Key vendors include Medtronic, Philips and Qualcomm. Growth in the remote-monitoring industry will be spurred by both private and federal initiatives. On the federal side, in 2018, the CMS proposed adding new codes for remote monitoring, signaling a future when providers are reimbursed more for monitoring patients from afar. The theory is that if patients allow their providers to track more data, clinicians can sense something is wrong much earlier than they otherwise would. Providers also gain a better understanding of the patient's health. For remote monitoring to work, patients must have the proper devices: internet-enabled versions of traditional medical devices, like blood pressure cuffs, glucose meters and scales. At Ochsner, the model is somewhere in between these two ends of the spectrum. 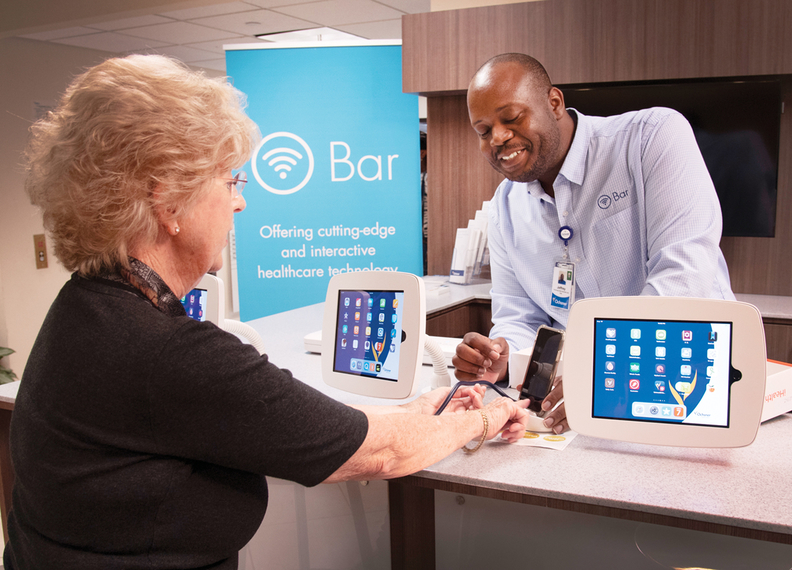 Ochsner patients can get hooked up with connected devices at O Bars, tech shops at the health system's major sites where patients can try out and buy new digital tools and get advice on apps. “It provides a resource, a library of content that we know is good,” Milani said. Ochsner Health System's O Bars offers a convenient place where patients can get connected. In the case of its Connected MOM program, after an obstetrician puts in an order, the patient goes to an O Bar to pick up the connected tools, which are free for the patient. For the high blood pressure remote-monitoring program, a patient pays about $30 for a connected blood pressure unit, which Ochsner sets up. Ochsner started the program without worrying too much about upfront costs. Because the system is fully or partially at risk for about a third of its patients, improving outcomes eventually pays off. “If you have a lot of lives at risk, if you're able to reduce unnecessary utilization, you're saving money,” Kilbridge said. With the more than 3,000 patients enrolled in the blood pressure program, control rates have nearly doubled compared with patients under the usual standard of care. Medication adherence and diet have also improved. And adherence to the program itself has been strong, with text messages and calls from the care team encouraging patients to stick with monitoring. Outcomes have similarly improved at UCLA Health, which has remote monitoring programs for certain chronic diseases and for post-operative patients. After cardiac surgery, for instance, providers might arrange for the hospital's home-device vendor to send the patient home with a scale, heart rate monitor, blood pressure monitor and pulse oximeter. Then, every day for a month, the patient will send measurements and answer questions about how they're feeling; if they miss a day, the health center's nursing team will get in touch. When gathering this kind of data from patients, it's crucial to have a system that automatically monitors some of the measurements, so providers aren't overwhelmed with numbers. “It's important to change an organization's workflow and approach to patient care,” Kilbridge said. At UCLA, the clinical team sets parameters for acceptable measurements, and the vendor manages the devices and monitors the dashboard of information. If there's a problem, the vendor will alert the clinical team, which could then get in touch with the patient. Through that program, UCLA has reduced post-operative readmissions for cardiac surgery patients. “We believe that it's a direct impact of the coordination and the patient's active involvement,” said Deidre Keeves, director of health IT adoption and engagement at UCLA. But remote patient monitoring might not always work. For instance, remote monitoring for hypertension was shown by one study to work only in adults older than 55. And in a meta-analysis published in Nature, there were no statistically significant differences between remote patient-monitoring techniques and control groups for six outcome metrics. The same techniques used outside the hospital might also be used inside so providers can more closely monitor patients when they're not directly at the bedside. Nurses at Denver-based UCHealth's Virtual Health Center, for instance, monitor patient vitals from afar thanks to connected devices. If problems arise, they tell providers on the ground or ICU doctors in the center, so they can quickly intervene. By using a virtual ICU, UCHealth can intervene significantly earlier for its inpatients. Now, the challenge is bringing that kind of monitoring to the home. “It's not just the devices that are important—it's the data science and prescriptive analytics and the devices,” Zane said. First, the in-home devices have to be reliable, he said, with high accuracy and connectivity as well as HIPAA compliance. Then, analytics have to be able to flag the data that providers should pay attention to. That's already happening in dribs and drabs with the Apple Watch. In the fall of 2017, the company and Stanford Medicine launched a research study using the Apple Watch to identify irregular heart rhythms and earlier this month the Food and Drug Administration approved the device for heart monitoring. The government in other ways is encouraging more remote patient monitoring. Along with the CMS' new proposed virtual care codes, the Federal Communications Commission is promoting greater use of telehealth through the $100 million Connected Care Pilot Program, which targets low-income people and veterans, particularly in rural areas.